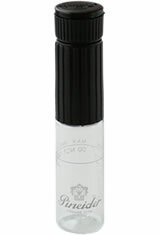 The Pineider Pen Filler is a portable inkwell ideal for transporting your fountain pen ink. The Pen Filler will hold up to 10ml of your favorite ink and has been designed with a opening with various diameters to match with different size fountain pens ranging from 9.5mm to 13.5mm. Made from lightweight durable plastic with a stopper style cap design. The Pineider Pen Filler Inkwells usually ships within 1 business day unless otherwise specified. Each Pineider Pen Filler Inkwells we sell is guaranteed to be genuine, authentic and will arrive brand new & unused! I like this pen filler. It does its job well, and it has measurements marked right on the bottle. It was a little weird coming apart to clean it. I prefer to decant my inks when I fill my pens, and then just keep refilling from the initial decant. This allowed me to get an extra full fill first try, and the pen cleanup afterwards was easy. Dumped the rest of the ink in a sample vial for next time since I reuse my fillers. You could also just store the ink in it for next time. It is a little pricey for what it does, but it shouldn't have to be replaced ever, either. The Pen Filler is the best way I have found to get my pens full of ink. So far the Pineider Pen Filler has worked okay on the few cartridge and piston filler pens I've tried, up to a Pelikan M1000. It will not work with the Visconti pens with the Hook Safe Lock system since you can't shove them in deep enough. Just make sure that your pen conforms to the two gaging holes in the box, passing through the large hole but not the small one. Then I test it first with plain water to be on the safe side. It seems to be a viable and economical solution. I tested this filler on five different pens: a Noodler's Ahab, a Noodler's Konrad, a Nemosine Singularity, a Pilot Kaküno, and a Pilot Metropolitan. The Metropolitan was less than satisfactory, in that the section had to go deep into the top to seal and I managed to spill ink getting it back out. It did fill, though, so from that standpoint it was successful. In use, once the vial has been filled one removes the plug from the top and inserts the pen's nib, turning the lower collar to cause the blue rubber sleeve inside to expand and seal the section in place. Then one inverts the assembly and activates the filler. The air in the ink reservoir bubbles out when the filler is reactivated, and the reservoir is completely filled. The problem I had with the Metropolitan was the section had to go deep into the blue sleeve to seal, leaving the converter the only thing sticking out. Pulling on it did not remove the section, which led to me disassembling the top and pushing the section back out. This is a slick idea, and it works very well. But Pineider? Can we have a slightly thicker rubber sleeve as an available option?